Who is this child? And who are her parents? Her demeanor suggests a royal heritage, but perhaps she is simply exercising pride and control of others. Meet Margelte, a most unusual child who mysteriously wins the hearts of those who disdain her. The secret is her relationship with a powerful God who watches over the fatherless. Filled with spiritual truths, this story will keep you enamored as you vicariously experience Margelte's suffering and her surprising reward in the end. From Jack Snavely of Castle Rock, Colorado on 10/18/2018 . I loved this book. Very touching. Unlike Cinderella, boys and girls will both like this one. Well put together. I especially like the tie to Joseph. We should always endeavor to be kind to "the least of these!" A very sweet book, with a very sweet girl in it who is such a great example of a Christian who lives her life in complete love! What an example! It does have a little mystery in it, which adds to the story! Great book!! This is a great little book! I loved how bold Maggie was as she found ways to show others their sin. The ending was great! Kids would love this book! VERY VERY VERY Highly Recommended!!! From The Rankin Daughter #2 (age 9) of Fort Worth, Texas on 7/20/2014 . I love this book! It is the best book we have read out of the Lamplighter books. I am so excited we started the third book tonight(The Little Lamb). 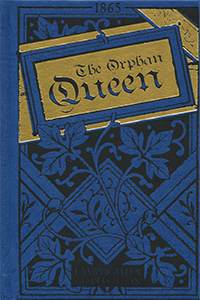 I love the Orphan Queen because it reminds me of Cinderella(that does not mean I like Cinderella, but I do love The Orphan Queen). From Marty of Girard, Ohio on 6/16/2014 . Loved this book. It is short but packed with practical ways of applying Biblical truth to daily living. Nice surprise ending.